Sustainability is an endeavor that affects us globally, but sustainable practices on the local level can be done in different ways and methods. In the Canadian province of Ontario for example, there is a directive called saveONenergy. Funded by the Ontario Power Authority, saveONenergy features a series of conservation programs that caters to both home and business. The programs have been designed to make resource management such as electricity consumption convenient. These programs are made available through the electric utility in the locality. More information about the programs, and the benefits one can achieve by making the most of the incentives and energy-saving ways provided by these programs is made available on the saveONenergy website, saveONenergy.ca. The Plasti-Fab office based in Kitchener, Ontario began their energy-efficiency upgrades by evaluating lighting opportunities then learned about one of the conservation programs from saveONenergy and began applying its concepts. Known as “Retrofit”, the program resulted in over $8000 in incentives to replace 86 HID fixtures with new T5 and T8 fixtures. A total of thirty-one motion sensors were installed in various locations across the Kitchener facility that made sure the lights were on only when employees were working in the area which led to better energy efficient levels. As a manufacturer of insulation products that helps commercial and residential customers reduce their energy use and greenhouse gas emissions, it comes fitting to take part of programs such as saveONenergy. As the business continues to grow, the focus on offsetting their environmental footprint remains. To learn more about sustainability, visit www.pfbsustainability.com. 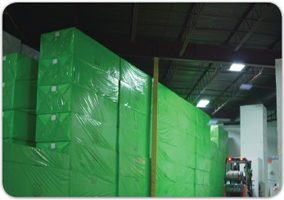 A saveONenergy video feature: Plasti-Fab Retrofit Program.